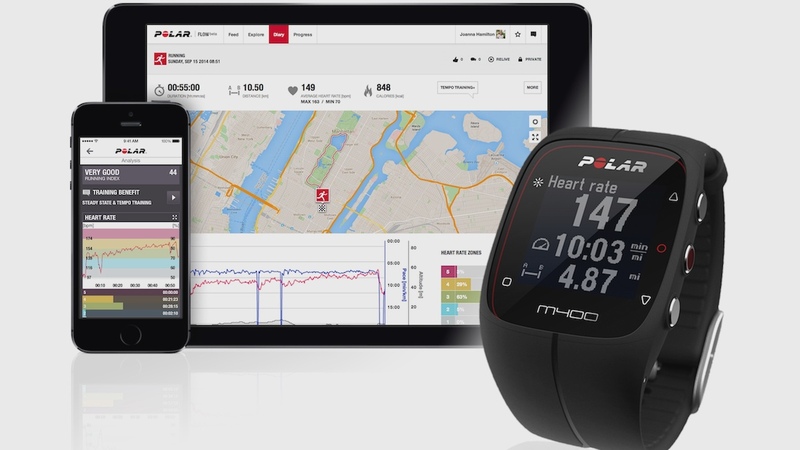 GPS fitness specialist Polar is back with a new wearable vying for your wrist space – the jack-of-all-trades Polar M400. Combining a toned-down version of the training features of the fantastic Polar V800 with everyday activity tracking, the Polar M400 will appeal to runners who want a more lifestyle friendly device. On the fitness side, the multisport-supporting watch offers GPS tracking for accurate run recording but lacks the built in heart-rate monitor of its bigger brother. However, it does make use of the awesome Polar Flow web and mobile platforms and features such as PB recording, interval training and run index rating are all present and correct. A neat feature on the Polar M400 is the ‘Back to Start’ method where the watch will guide you the quickest way home when you’ve decided enough is enough; a handy addition for runners who get lost when out and about. With regard to activity tracking you’ll be able to count steps, burned calories and receive alerts when you’ve been idle for too long. The Polar M400 is water resistant to 30m and you’ll get 24 days of regular use, or 9 hours of GPS tracking from a full charge. Polar has a huge range of wearable devices but with the M400 we’d say the Finnish company has perfectly placed a product right between its two recent hits: the V800 and the Loop fitness band. Hitting stores next month, it will cost £134.50, or £169.50 with a heart-rate monitor accessory and comes in black or white. We’ll bring you a full review soon to let you know if it meets our high expectations.